Organisers of the Great North Run have offered their "deepest sympathy" to the family of a 29-year-old man who died in Sunday's event. Details of the dead man, from the Barnsley area of South Yorkshire, have not yet been released. Extra safety measures and more medical cover were brought in for this year's 36,958-strong race, after four people died during the 2005 event. The main race was won by Henrick Ramaala from South Africa. A spokesman for organisers, Nova International, said: "Nova International can confirm the tragic loss of life of a 29-year-old male runner at the Great North Run and offer our deepest sympathy and condolences to his family and friends." The spokesman said additional medical and safety measures introduced after last year's multiple deaths had "worked well". Thirteen people have died since the event started in 1981. England manager and former Middlesbrough boss Steve McClaren fired the starter's pistol to start the 26th running of the event. The main race was preceded by the National Wheelchair Championships and the Women's British Half Marathon Championships. 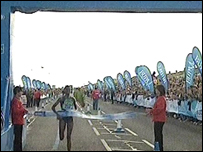 Ethiopia's Berhane Adere won the women's event, with Britain's Jo Pavey in fourth. The wheelchair race was won by Canada's Diane Roy, with Shelly Woods from Blackpool in second place. Redcar's Paralympic gold medallist Dame Tanni Grey-Thompson finished fifth. Celebrities who ran in the main event included Carol Vorderman - who was "Walking for Whiteley" in memory of Richard Whiteley - and actress Amanda Burton, as well as Chris Tarrant's estranged wife Ingrid. Friends and family of Leeds company director Reuben Wilson, who collapsed and died during last year's race, also took part. His brother Judah led a team of more than 20 people who stopped at the 11-mile mark where Mr Wilson died last September. 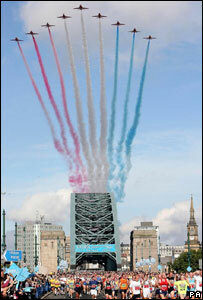 Were you at the Great North Run? You can send pictures and video to: yourpics@bbc.co.uk or to send via MMS please dial +44 (0)7725 100 100.